Malahat volunteer stephen e. leckie talks with Open Season Award poetry judge Russell Thornton about great poems as the meeting place between language and experience. 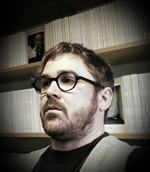 Russell Thornton's most recent book, The Hundred Lives, was shortlisted for the 2015 Griffin Poetry Prize. His poetry collection, Birds, Metals, Stones & Rain (reviewed on our site), was shortlisted for the Governor General’s Award for Poetry, the Raymond Souster Award, and the Dorothy Livesay BC Book Prize. Russell, thanks for taking the time to talk about your work and the upcoming Open Season Award. 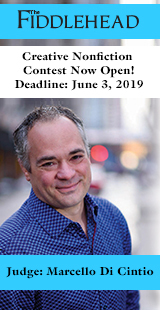 Your books have been shortlisted for two Dorothy Livesay Poetry Prizes, a ReLit Award, the Governor General's Award, and recently, the Griffin Poetry Prize for The Hundred Lives. Have these acclamations increased your love of words and poetry, as well as literary culture in Canada? These acclamations (if they can be called that!) have given me a genuine thrill or two—in particular, the opportunity to be introduced to people I'd otherwise never have met face to face. They've also given me a couple of two-three-day getaways, a few excellent meals, and more than a few glasses of fairly decent wine. Increased my love of words or poetry? For me, that's something like asking if I'd be more likely to breathe if I got rewarded for it. Only words or poetry can increase your love of words and poetry, I feel. And, of course, any love is its own reason. The literary culture in Canada? Well, I've loved Canadian literature, especially Canadian poetry, since I was in my late teens. I'd say that attending awards events has allowed me to get to know the culture a little better. The Governor General's Award has its long tradition and a dignity about it that I find very attractive. The Griffin Prize has a grandness and celebratory quality about it that I also find attractive. I don't think there's any doubt that the Griffin has added to Canadian poetry's international cachet. 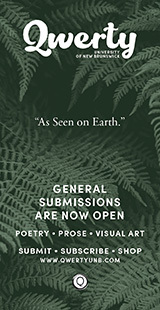 It's marvellous to see contemporary Canadian poetry mingling with current poetry from around the world—and offering its own varied, unique, significant sets of notes. 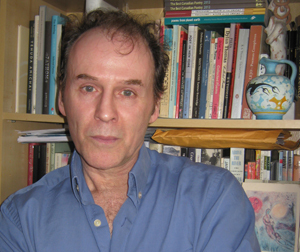 The whole extravaganza owes its existence to Scott Griffin, of course; he has a certain beautiful commitment to Canadian poetry. I attended the events feeling "proudly Canadian" as they say. 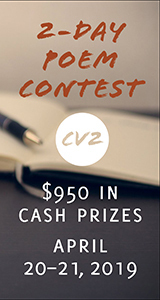 Do you have any thoughts on literary contests in Canada? Are they essential for new, as well as established writers to engage in the production of contemporary literature? I think most writers experience the impulse to get their efforts out into the agora—to engage in that sort of contest. On a basic level, of course, it's a similar situation when you build a table or chair; you're probably going to end up at least a little curious to see if anyone values the quality enough to want to sit at or in the thing for more than half a minute. And there's a simple and very real pleasure in seeing a poem of yours between covers and on nice paper (or on a nicely designed webpage) and in an elegant font with "winner" or "honourable mention" above it and among other people's poems that you think are good. With this, the publication and recognition can't be anything but attractive. And some contests offer sizeable chunks of change. 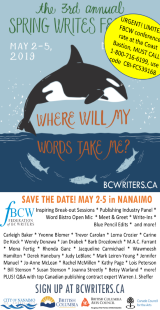 Is it likely that you're going to say no to your poem appearing in a magazine such as The Malahat Review and $1,500? I've entered contests for these common reasons. Also, in the case of the 2014 Open Season Contest, I tried my luck with a poem of mine called "The Man on Death Row Weds" because Jeffery Donaldson was the judge. I respect and admire Donaldson's work. I figured, if someone like Donaldson puts my poem on a shortlist, I'll have an excuse to feel all right. I try to feel all right as often as I can. I wouldn't say that literary contests are essential for new and/or established poets in producing a literature. I'd say that people will go on writing and publishing poems whatever the contest climate. In Canada, because the contests are there, the successes serve as laurels. Also, as far as I've seen, winners' names tend to signal arrivals of poets, especially when those poets win or place in more than one contest. What does a great poem evoke for you? Do you read differently as a poet and/or a contest judge? A great poem causes me to be speechless; it evokes silence. It also produces a feeling in me that I'm changed—that I'm not what I was before I read the poem. It's an act of magic. Robert Graves said, "Poetry is stored magic." I think he was right. To this day, I can't read Blake's "London" or Keats' "To Autumn" without experiencing a peculiar hypnotic pleasure. It's the same when I read D.H. Lawrence's "Bavarian Gentians," Yeats's "The Cold Heaven," Hopkins' "No Worst, There is None," Gwendolyn MacEwen's "Dark Pines Under Water," Elizabeth Bishop's "The Fish" or "Sandpiper"—to name the first few that come to mind. I'm initiated into levels of my being that I can't fathom. What I know is that the experience is visceral and spiritual at the same time and that it re-makes my awareness on the spot and communicates to me something of what it is to be human. I think a great poem occurs when language and experience meet—and become indistinguishable. Of course, the experience is extraordinary—and involves in itself a union of thought and feeling. And of course the language is extraordinary. The author of a great poem has something extremely valuable to say and says it superbly. An example for me would be Yeats's "Leda and the Swan." The language is mesmerizing—beyond "skilled." The experience—well, the vision arising out of the historical and mythological sweep, the containment of the enormous energies implicit in the vision, the intense, highly controlled passion—make it for me an unparalleled poem. It's an imaginative act of a specific period in the 20th century, and it's an eternal act; it goes on reverberating through time. I'd say that a great poem is also like an athletic event—like Roger Bannister's run of the first sub four-minute mile, Bob Beamon's Mexico Olympic Games long jump, Wilt Chamberlain's 100-point game, or Pele's 1961 gol de placa, when he was passed the ball in his own penalty area then took the ball by himself the entire length of the field, eluding every player who tried to stop him—and finally beautifully fired the ball past the opposing goalkeeper. The other day I happened to see a sailing team practicing out on Burrard Inlet. I could see the labour being performed—the sailors moving quickly and efficiently around the boats, lending their body weight to one or the other side of the boat, rotating the boom and capturing wind with the mainsail, capturing other wind with the jib, pulling the tiller. At every instant the current was working on the keels and rudders, the winds were coming strong and changeable. I thought of the single time I'd been on a sailboat out on the ocean. The feeling I had was that enormous forces were at play; the forces gained and gained in energy—but because they were being expertly controlled, and invited and controlled, they served an ongoing powerful composure. I felt the conflicts between the air and the water and the sailing vessel, and yet the travelling, the travelling at speed, felt strangely serene; there was a near miraculous stillness. It was as if in the continuing reconciliation of forces that the sailors and sailboat enacted they had become the lit, still core of the rhythm and glide. A great poem is a conjuring and reconciling of forces—the forces are the kinetic energies of words meeting vital experience and vice versa; the energies of association arising out of sounds and images meeting alerted, open consciousness and vice versa. I love what Dylan Thomas wrote in one of his letters about how for him a poem involved "a host of images" that contradicted one another; how he allowed these "warring images" as he called them to reconcile in a poem in "a momentary peace". I'd say that the bits of "momentary peace" that Thomas said he tried to create in his poems are here for as long as words are around—they're eternal moments. When it comes to judging a poetry contest, I'd like to think that I keep hold of my awe for the great poems of the language as I try to describe it here. I view a poem as good if it genuinely constructs a meeting-place for language and experience to energize each other. If a poem is all cleverly used language, to be honest I often dismiss it. If it is all cerebral display, I often say to myself, "Cleverness—and what?" If it is all emotional recounting of personal history that isn't universalized, I say, "Anecdote, autobiography—and what?" So I suppose I read in the same way whether it's as a reader, a writer of poems, or a contest judge. Is there any advice you'd like to impart on those writers who are reluctant to enter literary contests? How did you feel about submissions when you first started out as a writer? I'd say, don't be reluctant to enter a literary contest out of any kind of fear. If you have the inclination, take a shot, throw the dice. Participate. 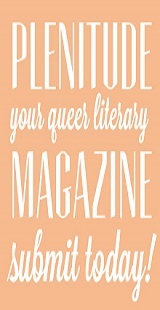 Personally, when I first started submitting poems to magazines I never tried contests. I thought contests were for "famous" poets. I thought the judges were far too "famous" and sublime to ever consider my poems as anything. I still try only a very few contests—but not because contests intimidate me. I pick and choose based on whether I think I have any chance given the poems I have on hand and the magazine and the judge—then throw whatever collection of words I figure might bring me luck onto the spinning wheel. In your readings and/or (re)readings of the classics and other literary periods, do you engage with the text or the author, or, a combination of the two? I'd say that in any genuine engagement with poetry there is going to be a combined awareness of the text and the author; that's as it should be. To assert that there is the text and nothing but the text, and this by way of claiming that absolute objectivity and absolute objective standards are available in a person's engagement with a poem—is, for me, wrong-headed. A reader can never be purely objective in his or her evaluation of a poem. A poem can never be purely an aesthetic object. To argue otherwise is like saying that you can chew off your own teeth. The author of the poem is alive in the poem—whether or not some literary theorists suggest that the author "does not exist." Of course, poems are in obvious enough senses made from the poems that have come before them. Yeats's "Leda and the Swan" owes a couple of things to Hopkins' "The Windhover." It almost goes without saying that a poet serves the language—but the poet serves it in his or her own way. And maybe, on some level, language itself writes a poem; maybe "the universe" writes a poem. And maybe in the process of writing a poem the poet is temporarily and necessarily immersed in a wider, non-ego existence (as in Irving Layton's "The Cold Green Element" or "The Swimmer," for example)—but the poet returns, reappears. The author is there; the author plays his or her part, so to speak. And the author (if the author is worth reading) is both a member of an eternal guild and a product of his or her specific environment, time, background, personal history, and so on—including his or her inner life. When I went to university, the idea that "there is no author" always struck me as theorists trying to denigrate writers and build up themselves. The idea of an aesthetic experience of a poem in which the writer of the poem can hold no significance at all struck me as belonging to an additional kind of blinkered outlook. "The Long Song of J. Alfred Prufrock" hands out a literary allusion or paraphrase or outright thievery every half-dozen lines. The poem displays its literary antecedents and debts everywhere. And of course the poem presents a persona. And maybe a persona involving multiple selves at that. But still, can anyone really contend that a once living, breathing, suffering young T.S. Eliot isn't evident in the piece? And that this isn't important in appreciating the poem? Can anyone read W.B. Yeats and not detect the "foul rag and bone shop" of Yeats's "heart"? Read Elizabeth Bishop and not sense the fierce, concentrated intensity of the personality within her poems? What about Sappho? I can't imagine experiencing the awe in reading even the small, broken remains of her poetry left for us to read without being compelled to try to draw a picture for myself of the person and life behind the particular desiring, heightened consciousness uttered in those lines—her lines. What about Pablo Neruda? When he says in "Enigmas" that he's no one ("I am nothing but an empty net…'), he's actually authoring one of his signature pieces. What about Shakespeare? Whoever he was, the actor son of a Stratford-upon-Avon glove merchant, Edward de Vere, Amelia Bassano Lanier (some people say that the chief candidate for the identity of "the dark lady" was actually the author of the plays), or some other in a list of early 17th century people, I'd say that it's impossible not to hear the very individual vocables of the person behind every significant speech from the early comedies to the histories to the tragedies to the final romances. This person is the author; the person existed; the person exists. Currently, what are you reading? What is on the horizon for your next writing project? Right now I'm reading Tracy K. Smith's Life on Mars and Liz Howard's Infinite Citizen of the Shaking Tent—both exceptional collections of poetry, I feel. I have a week off from all jobs, so I'm also re-reading Antony and Cleopatra, which I seem to re-read every late summer. It might not have the profusion of great individual speeches of Shakespeare's other great plays, I guess (still, it's hard to forget "The barge she sat in, like a burnished throne…" or "Antony, leave thy lascivious wassails"). I like the play as a whole; I feel it has a rich soulfulness. As far as my own writing goes, I've been working for a while at putting poems together for a manuscript that I'm tentatively calling The Terrible Appearances. I saw the phrase a long time ago in Saul Bellow's The Adventures of Augie March, and have never been able to get it out of my head. I'd like to see if I can make use of it now.